Have a look at the image below. The two best funded organisations are focused on Breast Cancer and Prostate Cancer. Neither of them are the biggest killers, representing less than 6% of the chance of dying of Heart Disease, for example. The very strong implication is that people will support partisan positions with money and time. Women give time and money to Breast cancer. And men to Prostate cancer. Regardless that this is statistically unlikely to be the one that gets them. Which is a bit sad really. 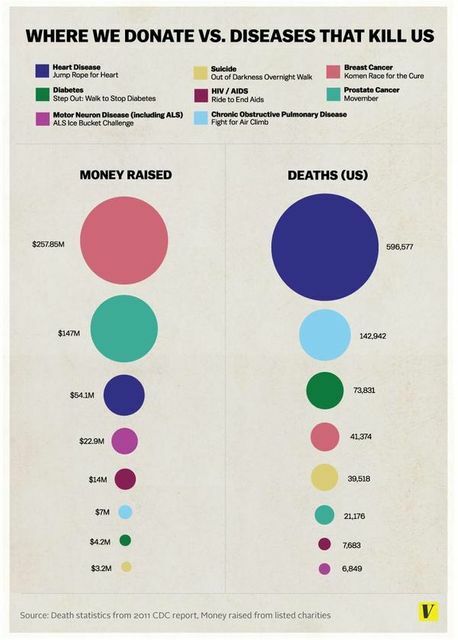 The article quotes 80,000 hours founder William MacAskill saying, "Donating money to the best developing world health charities will reach at least 100 times as many people than if you donate to developed world health causes." Ice bucket challange is fine, but it's wrong: http://t.co/8w1vA1MqjG.